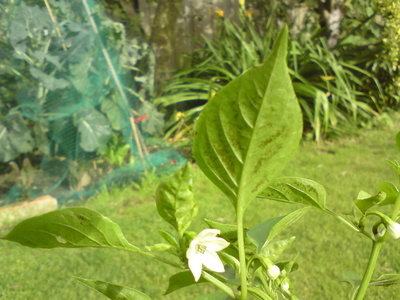 I am growing Capsicum frutescens for the first time and had a couple of issues. 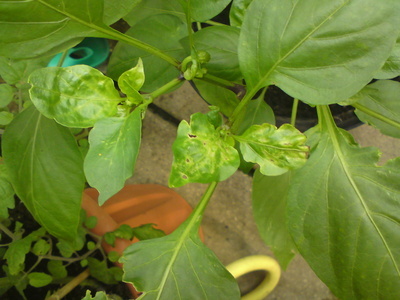 I haven't had many pests but I have had some crinckly/unhealthy leaves and dont know why. It might be nutritional. Also I have purple fruit that grows up from internodes rather than hanging down. Does anybody know what they are and is it normal? It's a little hard to tell, but the damage to the new leaves looks like thrips to me. They usually don't hurt the plant much, but they can make the leaves and some of the fruit ugly. Most often, they go away by themselves, and few non-toxic remedies help, since they are so good at hiding in the leaf and flower buds. 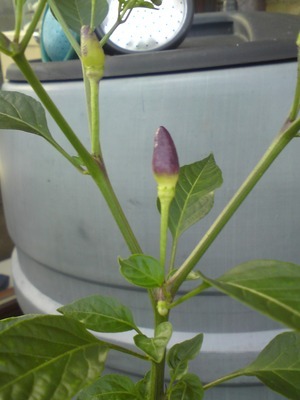 The upright purple fruit is just a surprise from the seed packager. No harm in it, but be aware that the upright kinds are often FLAMING HOT, since that is a characteristic of the Oriental peppers--think kung pao, or spicy Thai! Took the words right out of my mouth. Didn't know about the upright ones Scoville rating though. Thats great Tugbrethil. I have sprayed with a bit of soapy water and put some essential oil in for good measure and it does seem 2 be improving so Thrips sound right. But the purple fruit is a new 1 on me so thanks 4 the info. Thanks 2 u 2 Fractal! Hi Matt, we once had some purple ones at work that I think I remember were upright and though I didn't try them, someone said they were very hot. « my apple tree has something burrowing into the trunk, what is it.